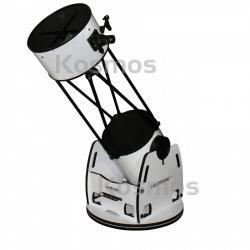 Meade LightBridge Plus 16", Kosmos Scientific de México, S.A. de C.V.
Meade’s LightBridge™ Series continues its legacy with our LightBridge™ Plus Series Telescopes. The LightBridge™ Plus Telescopes have a modern, sleek design that incorporates a no-tool assembly build. These telescopes have a large light-gathering capability to provide bright, clear images when viewing deep-space objects such as galaxies, nebulae, planets, and much more. If you’ve ever wanted a large aperture telescope but were unable to have the ability to move it around on your own, Meade’s LightBridge™ Plus Telescopes are here to make it practical. Available in 10, 12, & 16-inch apertures, this open truss design allows for increased portability over standard solid-tube designs and is able to provide easy setup and teardown for a large aperture telescope. The redesigned Dobsonian base has a no-tool assembly and provides improved stability. Includes premium features such as roller bearings, a hand-adjustable variable tension brake for smooth and stable movement, and a mounted eyepiece holder that can carry (1) 2” and (3) 1.25” eyepieces for your convenience. The LightBridge™ Plus Series Telescopes feature an upgraded 2”, 2-speed Rack and Pinion Focuser. The Rack & Pinion design includes a 10:1 fine focus knob for precise focusing and includes a Vernier scale with millimeter markings on the drawtube to assist with focusing accuracy. Included with the LightBridge™ Plus Telescopes is a 3-element, fully multi-coated 2” Series 4000 26mm Eyepiece - providing a 56 degree apparent field of view - and an aluminum Red-Dot Viewfinder. Also included is Meade’s AutoStar Suite Astronomer Edition- displaying more than 15,000 celestial wonders, this software allows you to view the night sky, constellations, planet positions and more from any location. The LightBridge™ Plus Series provides high-quality Meade® optics, ultra-portability, and remarkable performance for one affordable price. Get the aperture you’ve always wanted and open the doors to a whole new universe with Meade’s LightBridge™ Plus. Assembled Product Weight 144 lbs.